A pleasant, simple hole to start the round. 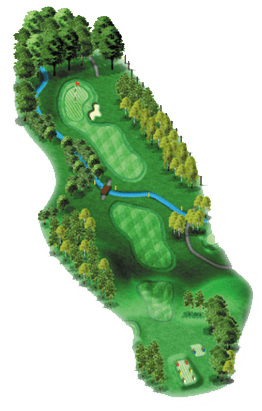 The drive is directed through the large banks and ideally should be left of the centre line to leave a more open shot into the green. 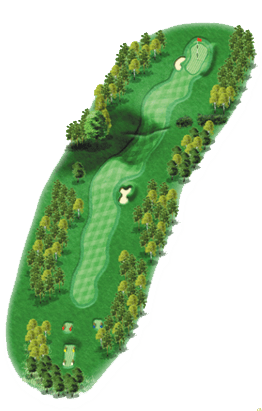 The second shot should only require a short iron to the kidney-shaped green. The first of the water holes. The drive is uphill to a ridge, with a bunker guarding the left side of the fairway. The second shot, must cross the lake to a large and receptive green, with mounding to the rear and left hand sides. After the loosening up process of the first two holes, the third hole requires two long, well struck shots. 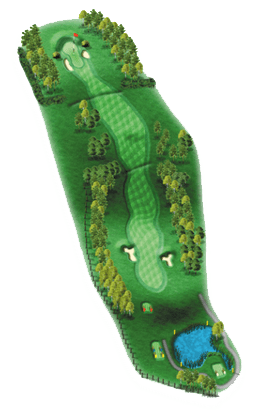 The drive is slightly uphill to a ridge and then falls away sharply towards the hole. The second shot is to a slightly elevated green, guarded by two bunkers. This hole is uphill all the way so plays its full yardage. 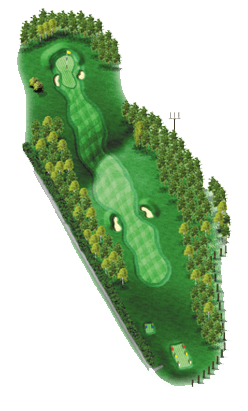 The green is long and comparatively narrow and is guarded by three bunkers – front left, middle right and back centre. From the elevated tee the hole snakes down past a lake on the right and up to a well guarded green with a narrow approach. Big hitters can reach in two, but a high degree of accuracy is required. The third shot has to negotiate two bunkers guarding the front left of a relatively small green. 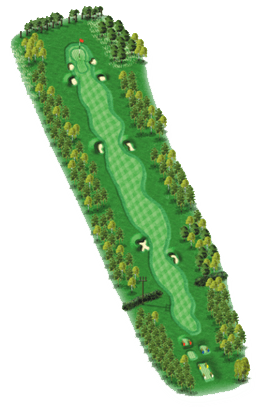 A subtle, shortish par 4, which uses the natural contours to good effect. There are two bunkers to negotiate on the drive. The ideal drive is down the left, which will open up the kidney-shaped green, guarded by the bunker from hell. 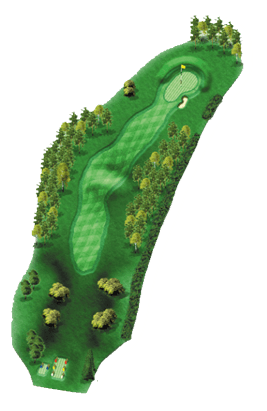 The green is situated downhill from the high tee, but has a severe slope on the front half and to the left. There is an out of bounds behind the well mounded rear of the green. A pleasant, natural hole where club selection is critical. 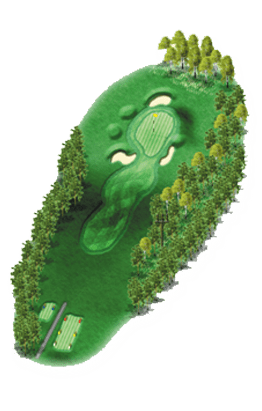 The green is situated in an elevated position, with a steep fall on the front and left, and is guarded by two large bunkers in front and middle right. A muscular 3 shotter which requires accurate shot making. 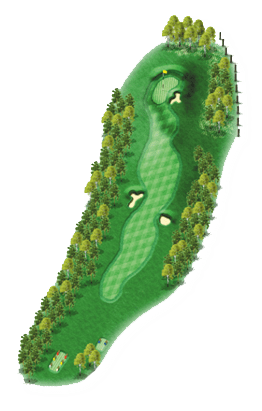 The drive should end on a flat, slightly elevated island fairway. The second shot has to cross a narrowish constriction, formed by the river and the road. 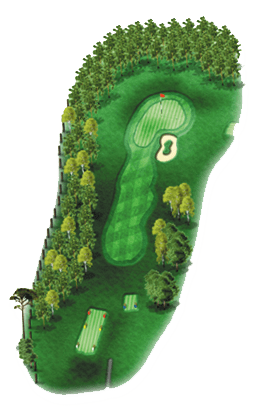 The third shot leads into a slightly elevated, rectangular, undulating green set in a natural amphitheatre. 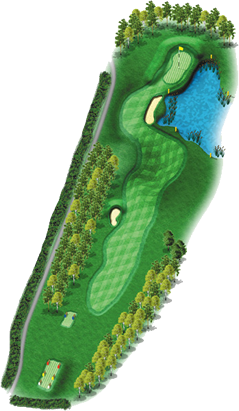 This is a truly heroic hole which requires a carry of 165 yards across a large lake. 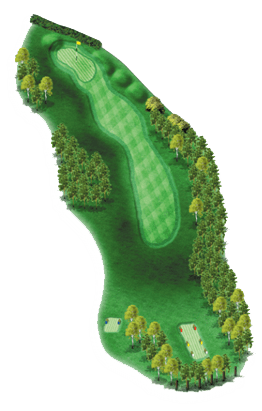 The green is sleeper fronted, comparatively wide and slopes up to a large mound in which is set a centrally placed bunker. A genuine three shot hole. 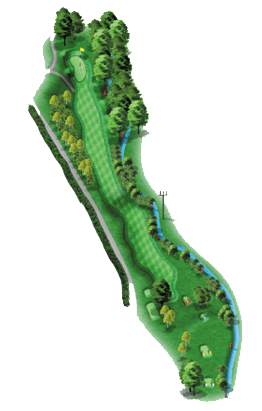 The drive from the back tee, which juts into the lake, must carry 80 yards of water up to a ridge with bunkers set left and right of the generous fairway. The second shot should be aimed to the right side of the fairway. The green rises steeply from front to back and is guarded by two large bunkers. Arguably the most difficult hole on the course. The drive is quite tight, with out of bounds on the left. 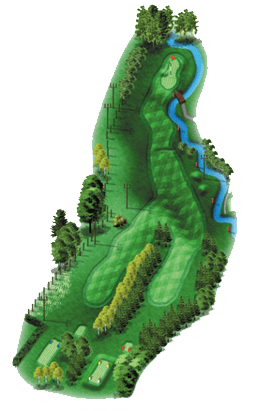 The hole then doglegs left to the bottom of a valley, where a loop in the river cuts into the front of the slightly elevated green. A short par 4, but fraught with difficulties. 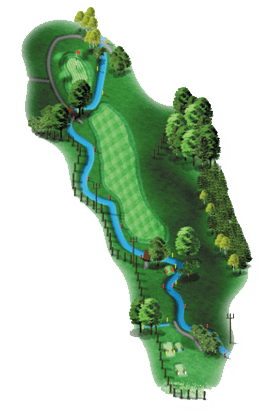 The drive is played over the River Wiske, some 110 yards from the tee, to a wide fairway. The second shot has to be played back over the river to an open and inviting green. Another uphill par 3 hole which plays its full yardage. A deep bunker lies between the two arms of the L-shaped green which is at the highest part of the course, offering exceptional views across the course to east and west. A straightforward par 5. The drive from an elevated tee must pass through a gap in the hedge to avoid bunkers on the left and right. 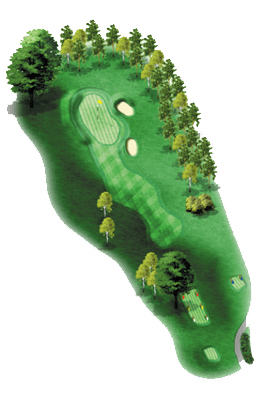 There is no particular difficulty with the second shot, but the third has to negotiate four deep bunkers surrounding the green. A testing par 4. 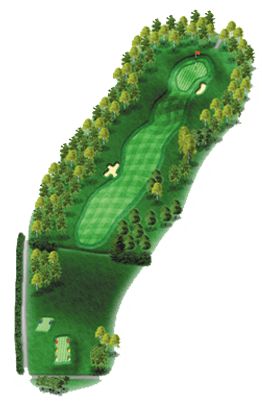 The drive must avoid a large bunker on the right and not be hit overlong as a valley runs between the end of the bunker and the green, which is guarded by a solitary bunker on the front left of the green. 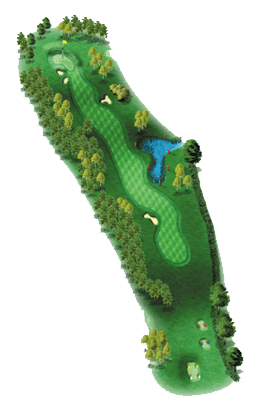 This is a short but spectacular par 4 finishing hole with two options facing you. 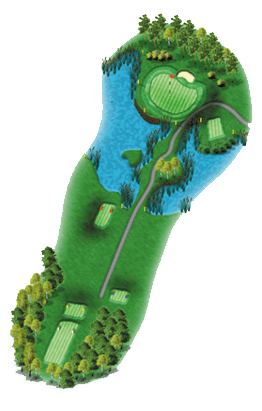 Either drive across the river, which is about 230 yards from an elevated back tee, leaving a pitch to the angled green avoiding the large bunker. Or play short and face a slightly longer second shot.